This is the forty-second of 87 letters exchanged during World War II between Nicholas Salvatore and Elizabeth Galloway. For more see Nicholas and Elizabeth. I am covered with red crosses and as per the Geneva convention am to be treated as a noncombatant. Sometimes, however, it feels more like a target. If the Germans talk like some of our own men do, then they have little respect for me. As I often hear from our side, the only good Nazi is a dead Nazi. I figure that must go both ways. What is my enemy? Death. My weapons are morphine and a hope the kid still believes in god. I am obliged to help the wounded – ally and enemy alike. The blood is the same, the pain is the same. 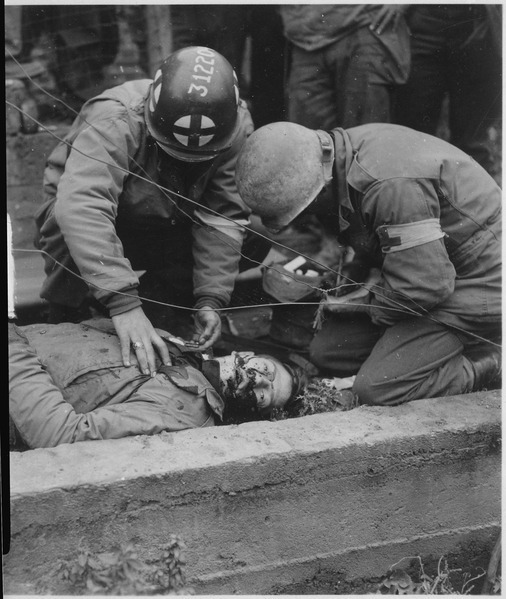 When you are trying to stop a chest wound that is gushing blood it’s impossible to tell if it’s a Nazi, an American or Jesus Christ himself. I tell them whatever they want to hear when they’re dying. I tell them everything is going to be alright. I don’t think it’s a lie. Wherever they’re going has to be better than this nightmare. Some cry, some rage against it. Sometimes I dictate last words to loved ones that I will never send. I hold their hands and shoulders and feel their bodies go limp. My training failed me and them by teaching me only how to treat the body. Instead of trying to block out the sounds of war and the marching of death I now focus all of my attention on it until the gunfire and screams of men turn into shapes and colors. I am lost in the white noise.